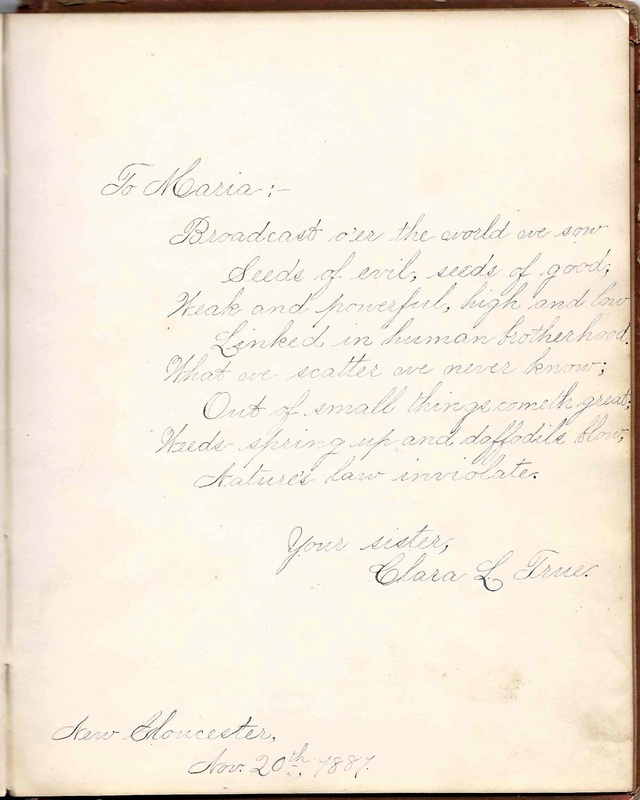 1879 to 1880s autograph album of Maria Anderson True of New Gloucester, Maine. The album, which measures approximately 7-3/4" x 6", is entitled "Flowers in Frolic" and features four hand-painted lithographs by the noted lithographer Fanny Flora Bond Palmer, who had emigrated to New York from England. 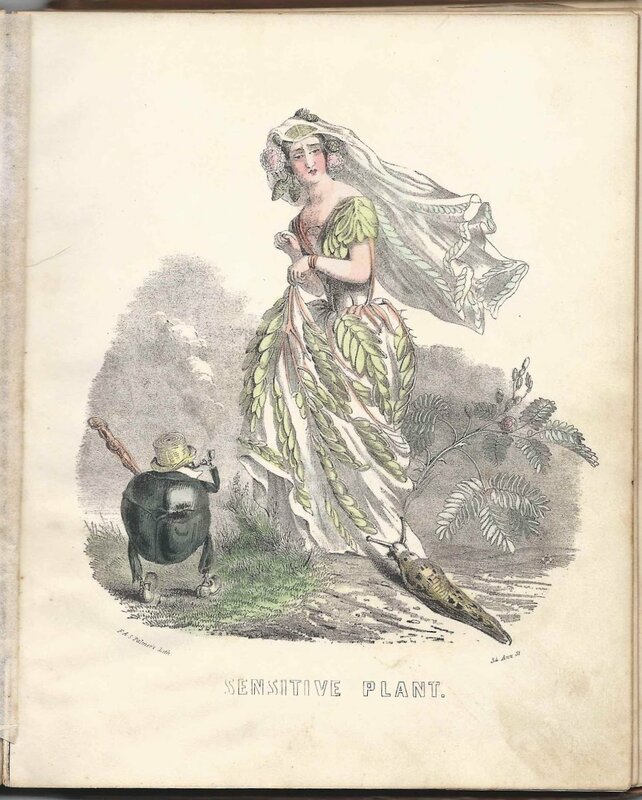 One of the lithographs originally in the album is missing: Pomegranate Foolishness. An alphabetical list of the signers and their sentiments appears at the end of this post. 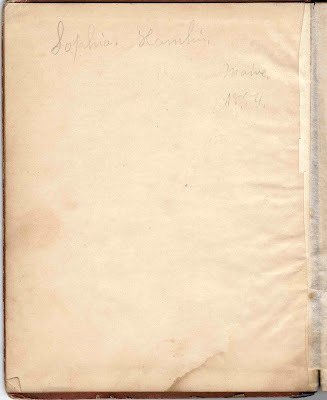 The reverse of the page signed by Maria herself has the inscription: Sophia Hamlin, Maine, 1854. Sophia may have been the original owner of the album, but didn't use it herself to collect autographs. 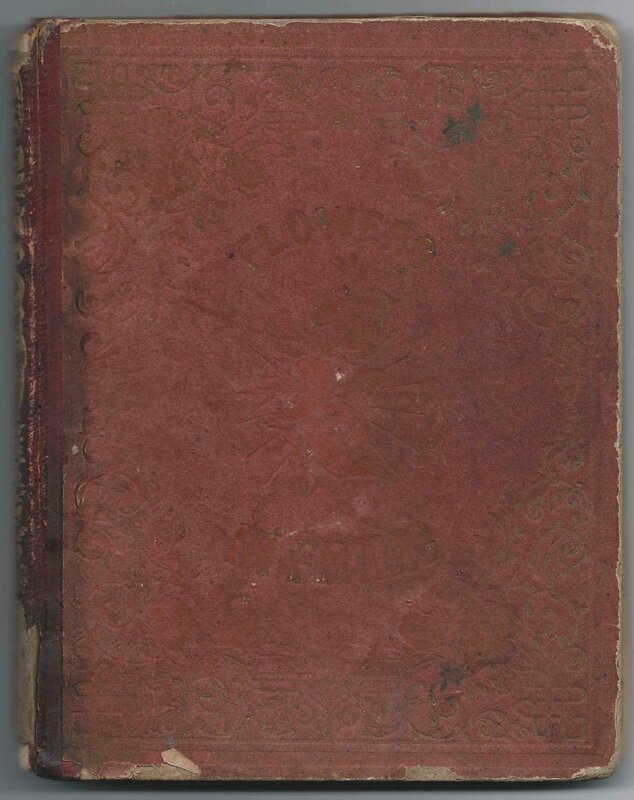 From online research, I found that the album dates to the 1844-1855 era when the album's printer, John C. Riker was in business at 129 Fulton Street, New York, and Fanny Flora Bond Palmer and her husband Edmund Seymour Palmer were in business as F & S Palmer at 34 Ann Street in New York City. The lithograph below appears to be the title page, with the text Riker, 129 Fulton St., N.Y at the bottom margin. The illustration itself has the address 34 Ann St. 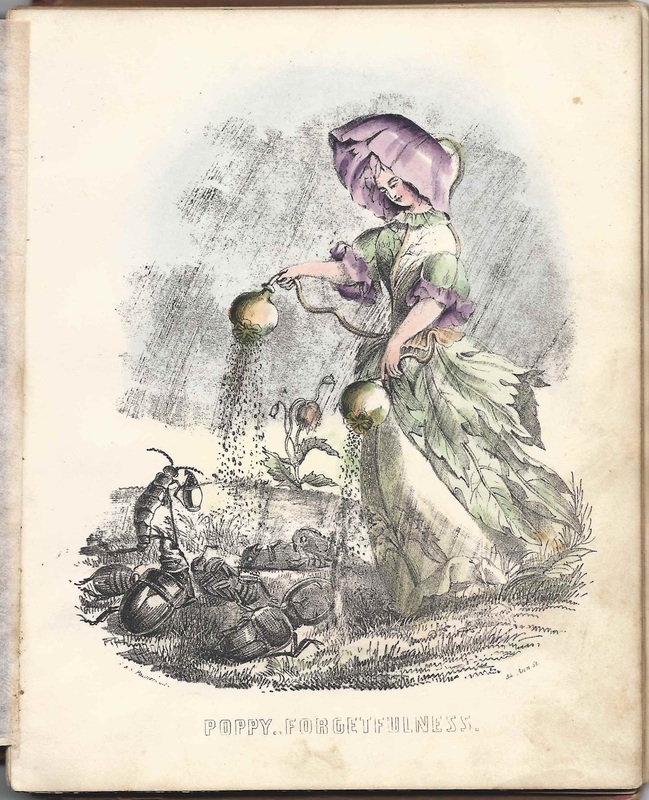 The four other lithographs, interspersed throughout the album, also show F. & S. Palmer's Lith. Researching online, I found a description of this very album here and here. I bought the album for its Maine provenance but it seems it's a very valuable album on its own merits. 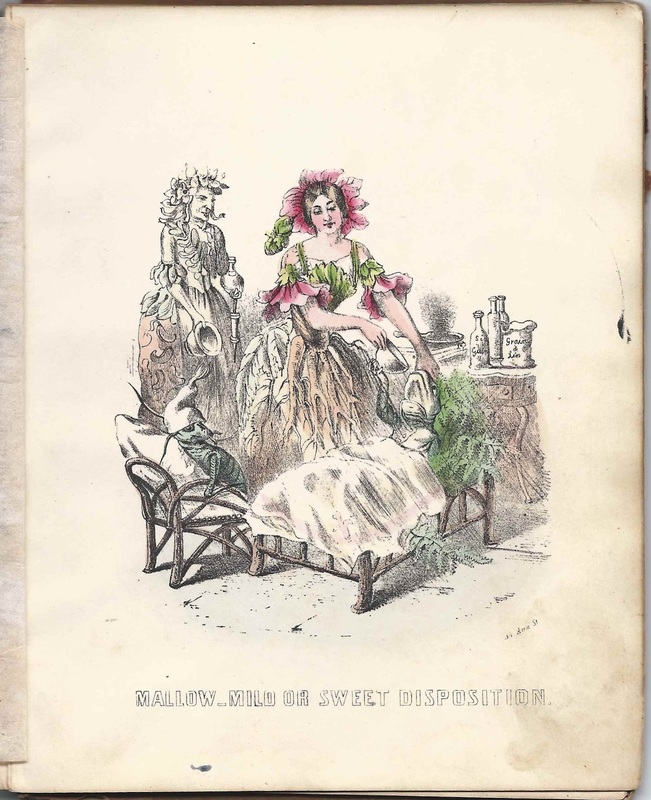 See the four additional lithographs at the end of this post. Maria Anderson True was born and/or christened on 20 October 1870 at New Gloucester, Maine, the daughter of Jabez and Celinda H. (Waterhouse) True, who were born at New Gloucester, Maine, and Poland, Maine. 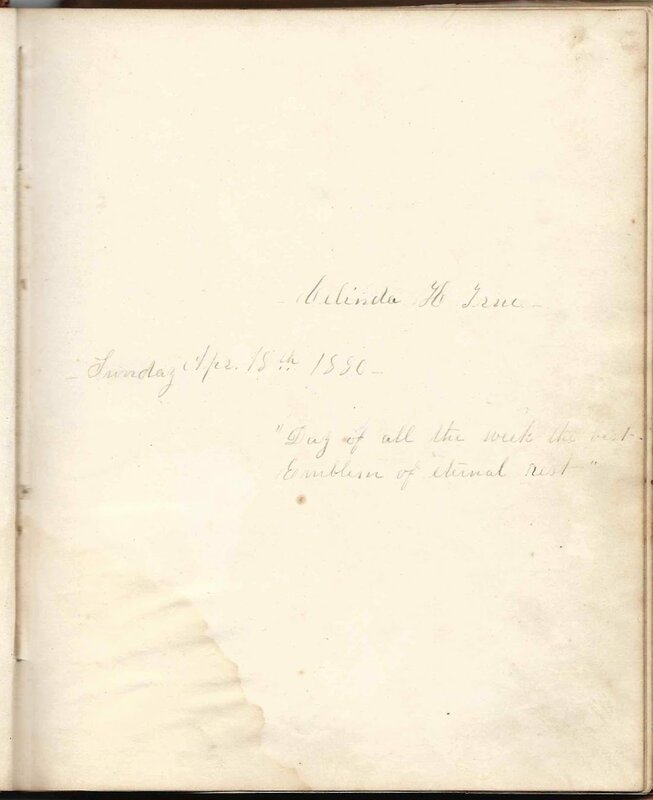 Maria's parents signed adjoining pages on Sunday, 18 April 1880. 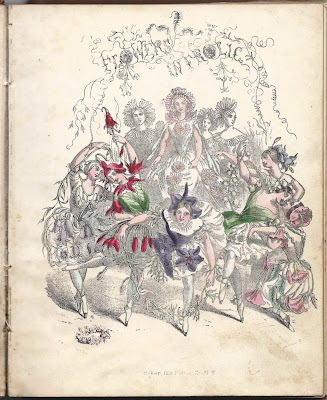 Maria had at least three siblings, two older sisters and an older brother, who all signed pages in her album. 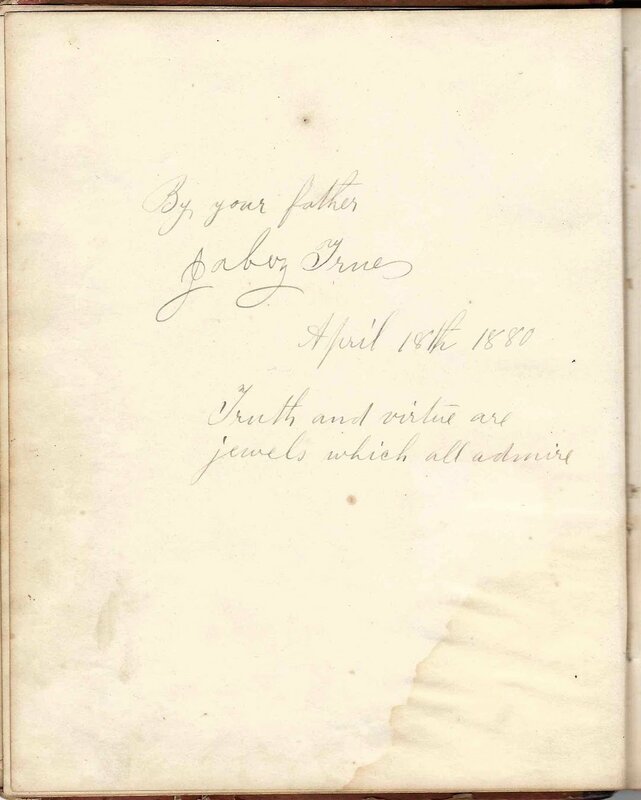 The page her brother Joseph signed came from a different album and was apparently inserted into this one. Edith True, born 28 December 1859. On 20 August 1900 at Cambridge, Massachusetts, Maria Anderson True married Charles Alfred Day, son of John M. and Hannah (Nevens) Day. Charles was born at Cambridge, Massachusetts, on 8 November 1867. Charles' parents were born at Carmel, Maine. At some point, Hannah's family moved to the New Gloucester, Maine, area. 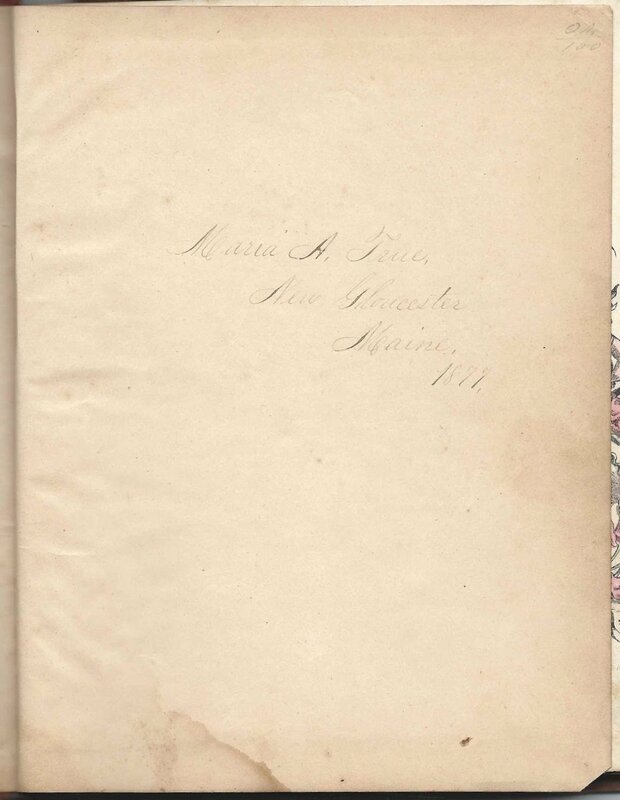 Several people named Nevens signed pages in Maria's album, as you can see in the list below. Maria and Charles lived at Cambridge, Massachusetts, after their marriage and had at least one child, a son Chester Morrill Day, born 12 December 1906 at Cambridge, Massachusetts. The family later moved to Watertown, Massachusetts. Charles was the superintendent of a cemetery. 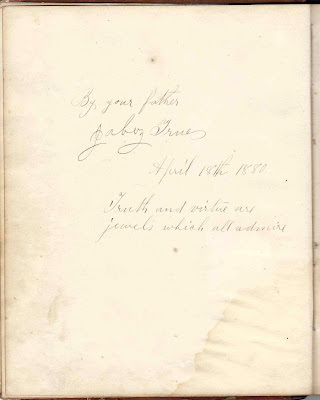 Julie N. Bailey, signed at New Gloucester, Maine, on 2 March 1882 "An autograph you ask, presuming then Upon a verse from this poor, prosy pen. What's in a name and what say verses more Than plan old truths we better knew before! To such endeavor let me not pretend But make my mark which tells, I am your friend. Very truly, Julie N. Bailey"
Achsah W. Bennett of New Gloucester, Maine, signed on 4 February 1880 "Your Friend"
Berttum R. Cleveland of Portland, Maine, signed on 14 August 1889, at the Lawson House at South Harpswell, Maine. 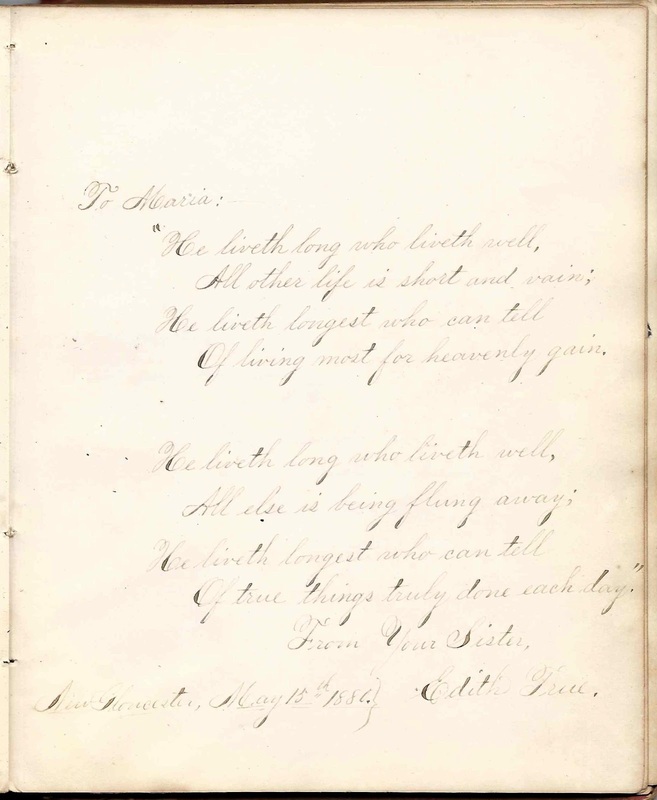 Written on what appears to be a page from a smaller autograph album. Perhaps this was Bertram R. Cleveland (1871-1957). Alice W. Cunningham of New Gloucester, Maine, signed on 29 May 1881 "Read see that me Up will I love And you love you Down and you do. 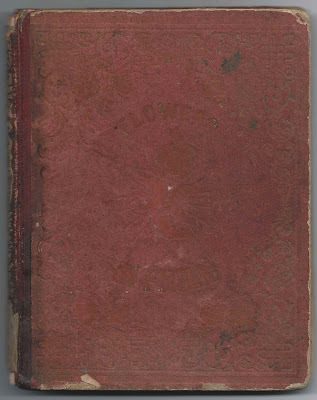 Your friend"
Gracie E. Curtis of New Gloucester, Maine, signed on 19 May 1881. "Your Friend"
Sophia Hamlin, Maine 1854. Perhaps Sophia was a previous owner of the album. Nettie E. Hill of New Gloucester, Maine, signed on 4 February 1880. "Your friend" Signed on the top half of a page, the bottom of which is missing. Perhaps that portion was signed by Maria and given to Nettie. Mary Etta Jordan, signed at New Gloucester, Maine, on 1 May 1880. "To Maria: God grant your life may ever be From cares and troubles always free And o your head rich blessings flow Bright roses on your pathway grow." Harry C. Lunt of New Gloucester, Maine, signed on 19 May 1880. "In the heart's remotest chamber, Pencilled on its ruby walls, Where the light of days departed With a mournful glory falls, There are many faithful pictures Upon which we love to gaze, For there are the smiling faces Of the friends of other days." Eben Nevens of New Gloucester, Maine, signed on 8 May 1880. 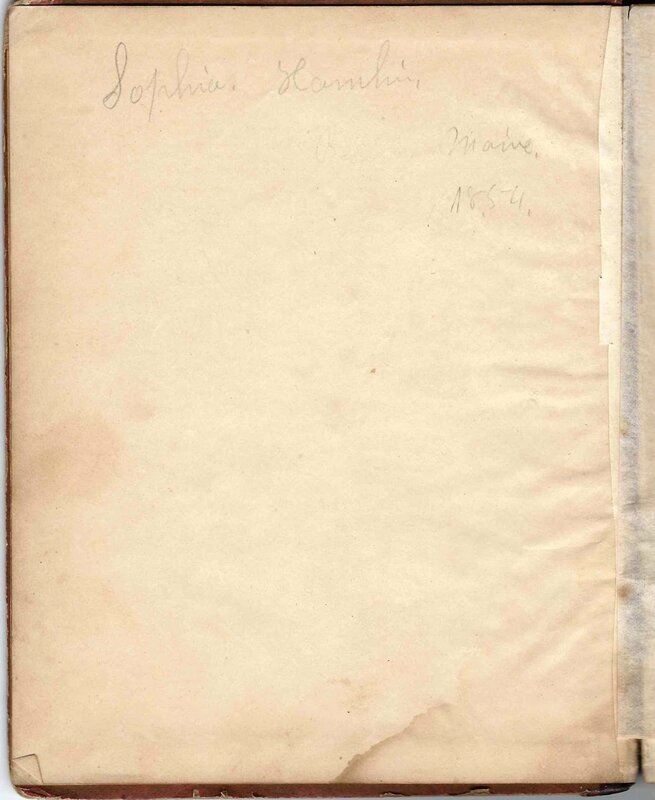 Signed on the top half of a page, the bottom of which is missing. Perhaps that portion was signed by Maria and given to Eben. Jennie Nevens of New Gloucester, Maine, signed on 15 January 1882 "When this you see, Please think of me, your friend"
Nellie L. Nevens, signed at New Gloucester, Maine, on 27 August 1878 "Dear Maria: - May you in life be truly best, May all your plans succeed; Be just as happy as I wish And you'll be blest indeed. Very truly your friend"
Rilla E. Nevens of New Gloucester, Maine, signed on 15 January 188x [possibly 1884, 1887 or 1889 or ?] "Remember me"
Nellie A. Thayer, signed on 4 February 1880 "To Maria: Not for a moment may you stray From truth's secure unerring way! May no delights decoy; O'er roses may your footsteps move, Your smiles be ever smiles of love! Your tears be ever tears of joy! Oh! if you wish that happiness Your coming days and years may bless And virtues crown your brow. Be still as you are wont to be, Spotless as you have been known to me. Be still as you are now. Yours truly"
Miss Cora E. Thayer of New Gloucester, Maine. Her message is written on the top portion of the page. The lower portion is missing and perhaps was signed by Maria A. True and given to Cora. Eliza J. 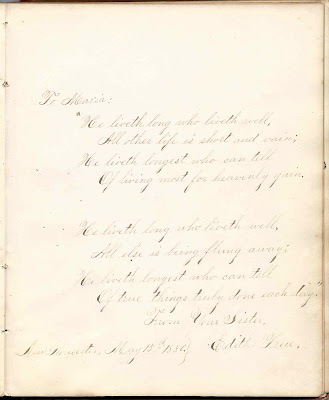 Ward of New Gloucester, Maine, signed on 4 February 1880 "To Maria, May your life while here below, Like a peaceful streamlet flow And when on earth your race is run May holy angels conduct you home. 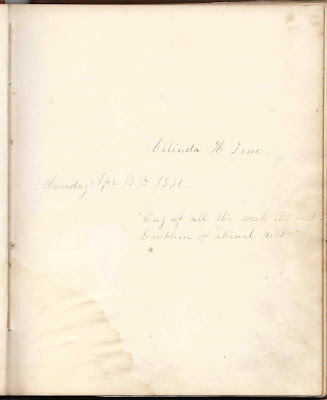 Yours very truly"
Jabez True, signed on 18 April 1880; Maria A. True's father. "Truth and virtue are jewels which all admire." 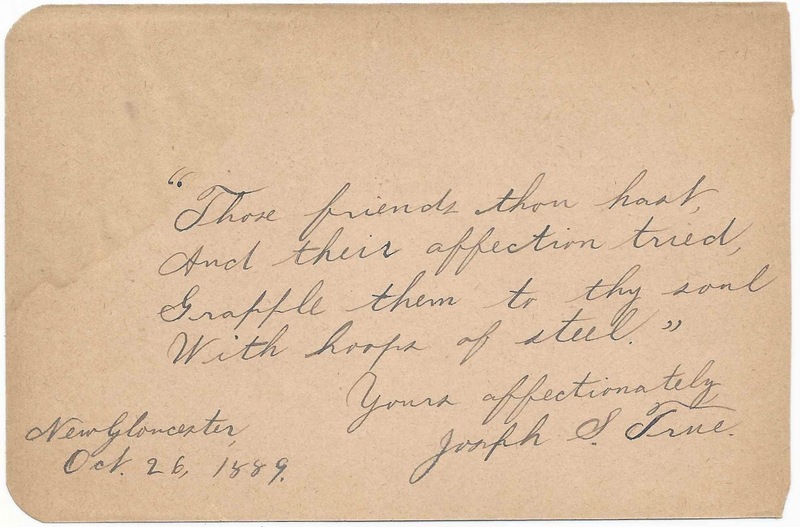 Joseph S. True, signed at New Gloucester, Maine, on 26 October 1889 "Those friends thou hast, And their affection tried, Grapple them to thy soul With hoops of steel." Written on what appears to be a page from a smaller autograph album. Addie P. True, signed at New Gloucester, Maine, on 23 April 1880 "To Maria: - Choose for thy daily walk Life's sunny side. So shall all peace and joy With thee abide. 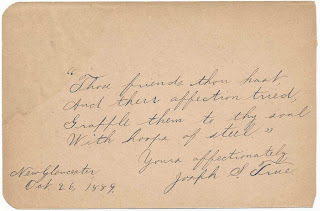 Ever your friend and cousin, Addie P. True"
Edith True, signed at New Gloucester, Maine, on 15 May 1880; Maria's sister. "To Maria: He liveth long who liveth well, All other life is short and vain; He liveth longest who can tell Of living most for heavenly gain. He liveth long who liveth well, All else is being flung away; He liveth longest who can tell Of true things truly done each day. From Your Sister"
Elbridge True of New Gloucester, Maine "Round it went Till here it came For me to write And here's my name." Clara L. True, signed at New Gloucester, Maine, on 20 November 1887 "To Maria: - Broadcast o'er the world we sow Seeds of evil, seeds of good; Weak and powerful, high and low, Linked in human brotherhood. What we scatter we never know. Out of small things cometh great. Weeds spring up and daffodils blow, Nature's law inviolate. Your sister, Clara L. True." Maria (True) Day died in Harvard, MA. on May 14, 1948 at the age of 77y. 6m. 24d. of carcinoma. Her husband, Charles Alfred Day died in Harvard, MA. on Sept. 26, 1953 at the age of 85y. 10m. 18d. Funeral services at the Story Chapel, Mt. Auburn Cemetery, Cambridge, MA. The couple bought a house in Harvard, MA. in October of 1946 with son Chester M. Day and his wife, Elizabeth E. Day. Thanks so much for taking the time to comment! I'm amending the post to give a heads up to readers to scroll down to your comment.